Ich find er sieht so jung aus auf den Bildern mit den Longdrinks! Zumindest auf dem ersten Blick. Dachte erst die wären alt von 2001!! Ich finde eh, dass er zurzeit aussieht, als ob er eine Verjüngungskur gemacht hätte. Was so ein bisschen weniger Stress doch ausmacht! 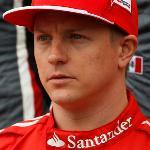 Kimi Raikkonen fun facts Did you know these fun facts about Kimi? 1. The 2015 Malaysian Grand Prix was the first race that a teammate of Kimi Raikkonen won since Felipe Massa back in 2008. 2. Kimi’s two favorite sports are hockey and racing and the reason why he chose racing, is, in his words “because I didn’t have to get up early in the morning”. 3. Kimi Raikkonen actually fell asleep for 30 minutes before his first race for Sauber, the 2001 Australian Grand Prix. 4. Back when a very young Kimi was racing for DeBruijin (in go karts), one day he was found sleeping in some card-box. From then he was given some small pocket money. DeBruijin used to give some money for hotels and food but the duo Jokinen (Kimi’s mechanic)/Raikkonen spent everything the first night they got to the destination – so one night of fun meant sleeping in the van. 5. Kimi is the sixth driver in the history who took at least one year off from Formula 1, after which later decided to make his return to F1 and won a race. Before the Finnish driver, this was managed only by Juan Manuel Fangio, Mario Andretti, Niki Lauda, Alain Prost and Nigel Mansell. 6. Kimi Raikkonen takes great care of his family and one time even invited twelve of his family members, including seven cousins, his grandmother, and four aunts at the Hungarian Grand Prix in 2001. 7. British businessman Ron Dennis is the one who actually gave him the “Iceman” nickname, at the beginning of the 2002 Formula 1 season, when Ron Dennis was McLaren’s team principal. 8. Before joining Sauber Formula One team in 2001, Kimi Raikkonen competed in the Formula Renault UK Championship. In 2000, the young Finnish driver won seven out of ten events in the Formula Renault UK Championship and was on the podium in all ten races. 9. Kimi’s other nickname is “the second Flying Finn”. The first was Mika Hakkinen. They are both born in the same place, Espoo (the second largest city and municipality in Finland), and have both been very quick on the track. They were simultaneously on the grid for only one year, in 2001, when Raikkonen made his F1 debut with Sauber, while Mika Hakkinen competed for McLaren and at the end of the season decided to retire from Formula One. 10. Kimi’s mother, Paula, remembers him only once being very nervous and losing his cool outlook. He was six years old at the time. Paula took her son for a regular check-up with their doctor and Kimi had to wait in the corner with toys to keep him busy as his mother and the doctor discussed. There were many toys, but suddenly Kimi became agitated, biting his finger nails and acting very nervously: “The doctor started to think that Kimi perhaps had a concentration problem.” – Paula said, when interviewed about Kimi’s childhood – “but it was only a question of the toys!”. 11. Kimi Raikkonen’s brother, Rami, has two sons, Justus and Tiitus. Kimi is a godparent of the elder, Justus, and continually brings presents for both of them. 12. At the 2012 Monaco Grand Prix, Kimi showed his respect to a driver of the 1970s when he incorporated the James Hunt design and name on his helmet. 13. After Nico Rosberg’s retirement from Formula 1, Kimi Raikkonen is the only driver on the grid with more than 100 races for his current team (Scuderia Ferrari). Kulta So einen Gärtner hätte ich auch gerne. Minttu hat das gestern in Insta gepostet (ich hoffen, Ihr könnt es sehen). Und Kimi hat ein neues Motorrad.